Note: The ASUS ROG PG27VQ is now available for pre-order on Amazon. As we are anticipating the ASUS ROG Swift PG27UQ, one of the first monitors to feature 144Hz refresh rate along with 4K resolution and HDR support, ASUS has revealed two additional gaming monitors at the Join the Republic: Outshine the Competition event in Berlin, Germany. Besides the new gaming monitors, ASUS also announced new gear such as the ROG Poseidon GeForce GTX 1080 Ti graphics card with the next-gen DirectCU H2O technology and wing-blade fans as well as the ROG Maximus IX Extreme, the world’s first motherboard with built-in water cooling monoblock, and many other cool gadgets and hi-tech toys. 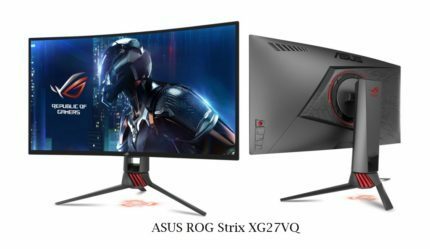 The ASUS ROG Strix XG27VQ is a 144Hz curved gaming monitor with the Full HD resolution and a frameless design. 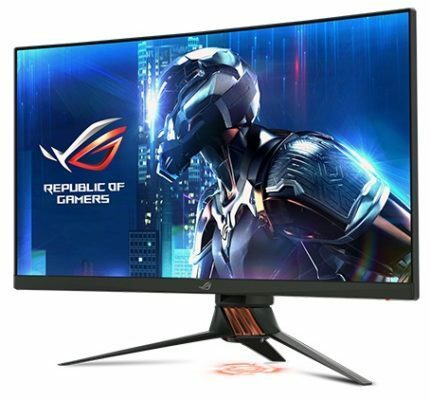 Apart from that, there isn’t any more information available about the XG27VQ, so we will focus on the specifications of the ASUS ROG Swift PG27VQ. The adaptive sync technology, quick response time, and high refresh rate are the key ingredients for the smoothest gameplay experience desired by the professional competitive players. The ASUS PG27VQ unquestionably meets all the demands, but it will take the competitive gaming to the next level in terms of image quality. The quantum-dot technology will offer the players a wider color gamut for an improved color accuracy and saturation, which may make up for the inferior color reproduction of the TN panel monitors. Although the monitor has quantum dots, there isn’t official information whether the display will be able to produce a bright enough image to support HDR. In addition to the overall significantly better image quality, gamers will be able to fully immerse into their games thanks to the curved screen which makes for a more convenient and engaging viewing experience. Naturally, for the smoothest gameplay experience possible the Nvidia G-Sync allows you to synchronize the frame rate between your graphics card’s GPU and the monitor, thus eliminating screen tearing, stuttering, and reducing input lag. With the rapid 1ms response time you won’t encounter any ghosting and trailing of the fast moving objects in the fast-paced video games, allowing you to focus on the action with no distractions. Furthermore, the 165Hz makes for the perfect refresh rate since there’s no significant difference beyond that and because the computer gear requirements for reaching 165Hz are feasible. 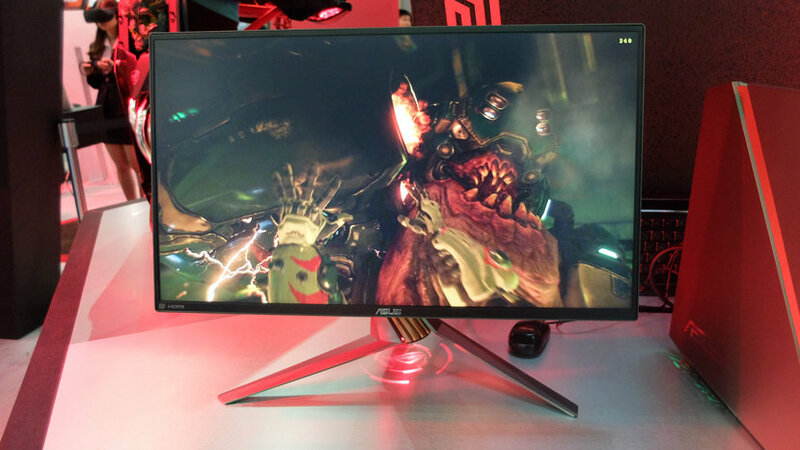 As far as the ASUS XG27VQ is concerned, it will have a 144Hz refresh rate, 1080p resolution, and a curved screen. ASUS noted that it will feature the adaptive sync, but not whether it will be G-Sync or FreeSync. Panel type is also unknown, however, we know that the display will feature the low blue light filter and a flicker-free screen. In the picture below, we can notice that it will have a slim bezel and the standard trademark ROG design with the logo illuminating feature. The ASUS PG27VQ features a little wider bottom bezel but an attractive design nonetheless. Besides the illuminating logo feature, this monitor will offer the unique RGB LEDs at the backside which you will be able to match with the rest of your Aura Sync gear and on-screen action. At the moment, we have no information regarding what display connectors and ergonomic features any of these two monitors will have. 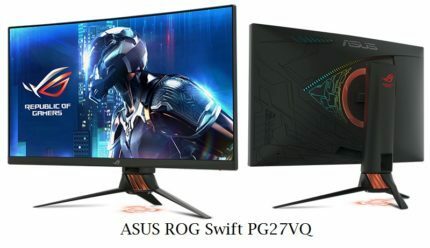 The release date of the ASUS XG27VQ is unknown while the ASUS PG27VQ is now available for preorder. the prices are unrevealed as well. All in all, ASUS has got many exciting gaming technologies planned for this year and next year, and we cannot wait to get our hands on it. 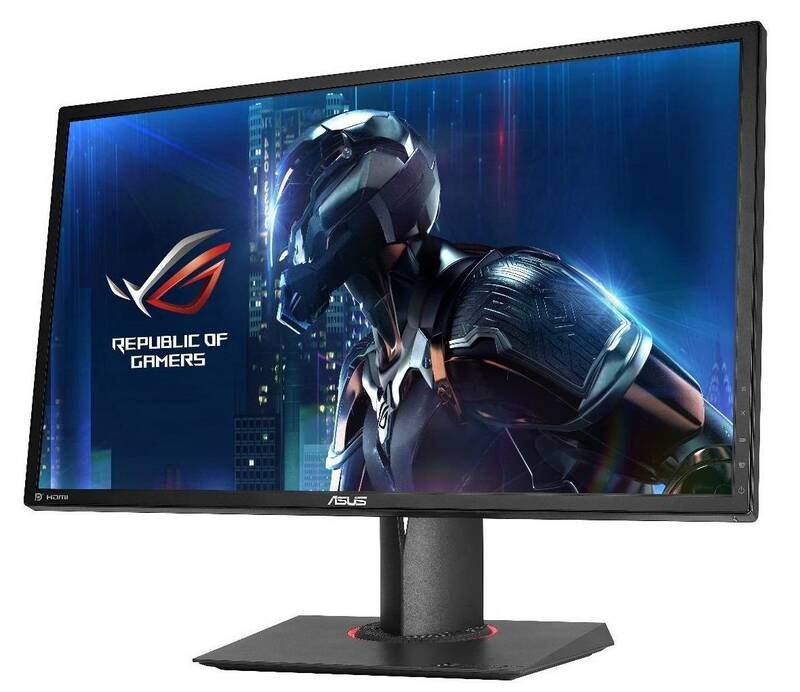 The ASUS PG27VQ will most certainly appeal to the high-end competitive players who will finally be able to gain a considerably better image quality whilst still maintaining the impeccable 1ms response time. The new lighting gimmick is a nice touch, but hopefully, it won’t add much to the price. 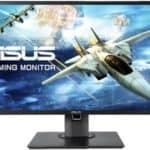 The ASUS XG27VQ may repulse many customers due to the low resolution, however, since we don’t have all the information about it, we won’t judge it just yet. The ASUS PG27VQ will bring competitive gaming to the next level as professional players will be able to enjoy an immersive and vibrant image quality while still keeping the 1ms response time speed. With the built-in Aura Sync, you’ll be able to match the lighting of all your compatible peripherals and components. Overall, it’s looking to be one quite awesome gaming monitor and hopefully, it won’t cost too much! I wish they made a 24 inch monitor with 144hz, G-sync, 1080P, 1MS and Quantum-Dot Technology. NOT CURVED. Why is it so hard to have this monitor made? Curved eliminates glare – why straight?